Queen Dog has ruled her castle with grace and majesty since she was a pup. Her people adore her. They provide her with delicious meals and shower her with attention. Lately, though, they have been a bit distracted and service has started to slip. Queen Dog tries her best to make do - but then a stranger moves into the castle! Who is this little newcomer commanding all the attention? A servant, or a pretender to the throne? 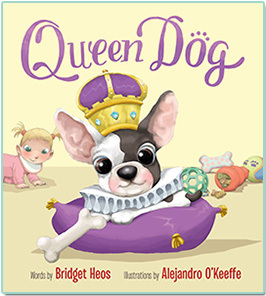 With comic action and a regal twist, Queen Dog turns a royal pain into a perfect princess.